Apple Cider helps maintain a healthy fluid balance and digestive system, and is an easy and convenient way to take apple cider vinegar. An effective natural formula of apple cider vinegar, dandelion, and globe artichoke extracts, all designed to make you naturally slim down and feel lighter. In Apple Cider high strength, you get an effective solution against water retention, but at the same time, the combination of ingredients helps your metabolism and digestion of fats, all escalating the effect on weight loss. Apple cider vinegar is safe and used with success for decades. 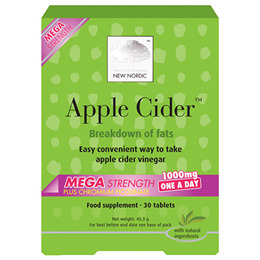 Provides 1000 mg highly concentrated apple cider vinegar per tablet. Apple cider vinegar powder, filling agent (microcrystalline cellulose), globe artichoke (Cynara scolymus L.), dandelion extract (Taraxacum officinalis Web. ), coating agents (magnesium-stearate, hydroxypropylmethyl cellulose), disintegrator (crosslinked sodiumcarboxymethyl cellulose), anticaking agent (silicon dioxide), mineral (chrome picolinate). Caution: Seek professional advice before using if you are pregnant, breast feeding or suffer from allergies. 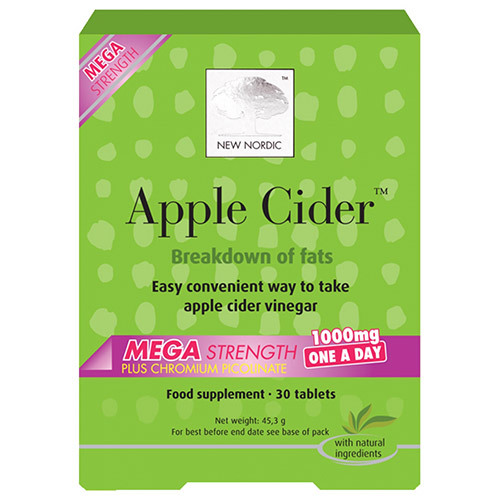 Below are reviews of New Nordic Apple Cider Mega Strength - 30 Tablets by bodykind customers. If you have tried this product we'd love to hear what you think so please leave a review. I take organic cider vinegar in water every morning for arthritis and wanted to boost this for a while. I can only trust the tablets 'work'. I certainly felt much less need for painkillers while taking them but have to be honest and say this could have been due to the weather conditions.